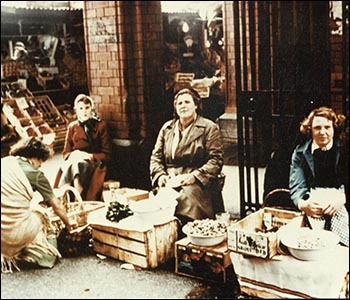 The cockle stalls at the centre of Swansea Market continue the long tradition of selling fresh Penclawdd cockles here. Cockles were harvested by women along the north Gower coast, then washed, boiled and unshelled. You can read more about this on our page about the cockle fishery. Many cockles were loaded onto donkeys for transport to Swansea market. Local women would walk with the donkeys and sell the cockles. The journey was about 12km (8 miles), and for many generations the women walked barefoot to the edge of Swansea, where they would put on their shoes. By the late 19th century they could afford to wear shoes for the entire journey. Donkeys continued to take cockles to Swansea for decades after Penclawdd was connected to the rail network, although some cockle sellers did use the trains. One of them, Ann Hopkins, 89, suffered a fatal heart attack in 1896 in a train to Swansea Victoria on her way to the market. 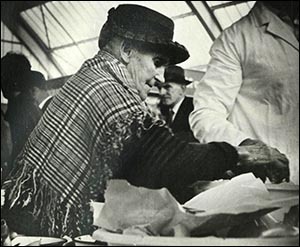 A report in The Cambrian newspaper in 1890 describes how the cockle women stood out in Swansea Market in their homespun Welsh flannel. The gowns were mostly red and black. Shawls, also known as turnovers, were grey or black and white. The headgear was half bonnet, half hat, resembling a cockle shell - as shown in the photo on the left (both photos courtesy of West Glamorgan Archive Service). The Penclawdd cockle woman was “not ashamed to show her shapely legs in black stockings”, noted the reporter! The cockle stalls are still kept by members of Penclawdd cockling families, including Carol Watts. On St David’s Day, she wears the costume of her grandmother, Margaret Phillips, except for the “cockle shell hat”, which is woven like a basket and too heavy for comfort. Carol started helping at the family’s stall when she was five years old and remembers donkeys carrying cockles ashore before horses and carts replaced them in the 1960s. Also sold at the cockle stalls is laverbread, which is made from seaweed and traditionally accompanies cockles.